As our Young Artists production of Ariadne auf Naxos opens next week, we thought we'd provide our popular Spotlight guide for additional background information on the opera. Find answers to all your questions about the opera, such as "Who's Who," "What's going on?" and "What exactly is comedia dell'arte?" Additionally, learn about the opera's Prologue and what to expect, the myth of Ariadne, and tips for listening to Strauss. 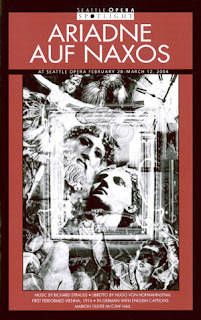 This guide was written by our own Jonathan Dean for Seattle Opera's 2003/04 mainstage production of Ariadne. View the guide in full here. This blog says at the end "View the Guide here", but there does not seem to be anywhere to "click" to accomplish this feat. HELP!! In the last sentence of the post, the word "here" links to the guide.